Bergenias impress me. They are almost (in my garden, at least), the perfect small perennial. They look good, with pretty flowers in spring, and beautiful green foliage with a touch of autumn red. 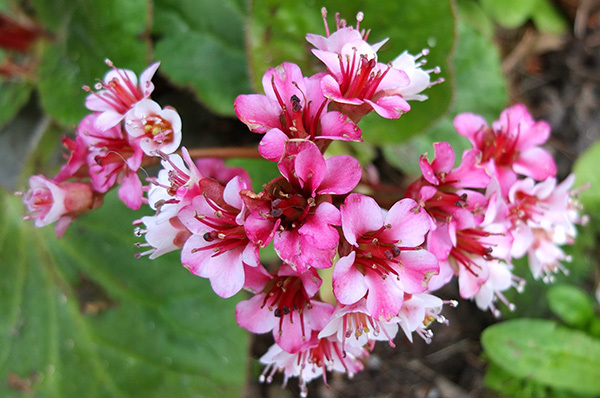 They're easy to keep tidy - I grow mine in patches alongside paths. 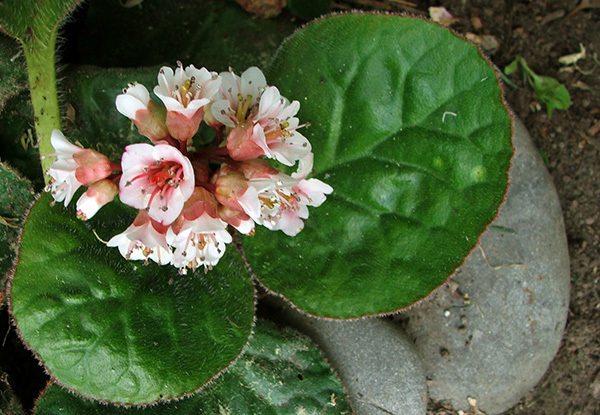 It's easy to increase Bergenia stocks - plants will fill out nicely in a few years, and a clump can be divided up and replanted. No problem! I didn't realise that they are also called 'pigsqueak', though I've heard the common name 'Elephant's Ears'. That seems rather silly, since the leaves are beautifully glossy and rich in colour. Some springs I prefer the creamy and deep cherry red flowering varieties, which I believe are both bred by Bressingham. That's what their labels said, anyway. My newest Bergenias have huge leaves with hairy edges - they are the variety 'cilata'. There are some interesting paragraphs in the old-school gardening book by Marjorie Fish called 'Ground Cover Plants'. So she saw her Bergenias as ground cover, and she obviously adored their foliage.